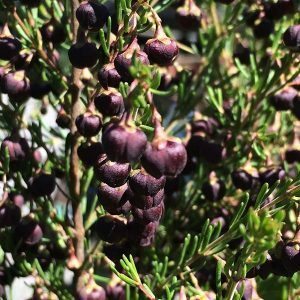 This is the Brown Boronia and perhaps the best known of all. You might love it for the fragrant flowers, or perhaps because it featured in the children’s stories about the Gumnut Twins, Snugglepot and Cuddlepie. With a bit of a reputation as being difficult to grow, if you provide the right position it is not that difficult. Boronia megastigma with its strongly scented flowers in spring has been a favourite with gardeners for many years. Today, improved cultivars are available, bushier and hardier, yet still with great flowers and fragrance. Boronia megastigma ‘Heaven Scent’ is one such improved form, it has small bell shaped flowers, a rich brown to purple, with a yellow interior. The flowers are not large, however they appear in profession in spring to summer. The fragrance is more intense on this variety. To put it simply, Boronia megastigma prefers a moist well drained soil and does not like to dry out. It has a shallow root system, so it needs the right position. We suggest dappled shade and protection from the hot afternoon sun and hot northerly winds. Soil preparation before planting includes digging in some well rotted compost and ensuring that drainage is good. After planting, water in well with a liquid seaweed fertiliser. You can also place some rocks around the plant, these will help keep the root system cool and moist. During long dry periods in summer, the occasional deep soaking may be beneficial. You try the hybrid ‘Purple Jarred’, it is much easier to grow, and has great flowers. The variety ‘Heaven Scent’ is fairly compact, however it will still benefit from regular light pruning. Like others it best immediately after flowering. Always prune during cool weather when the plant has been watered. Position – Part shade to light shade. Spread – Will spread to around .8 metres. Foliage – Mid to deep green..
Drought tolerant – Will require some water during long dry periods.